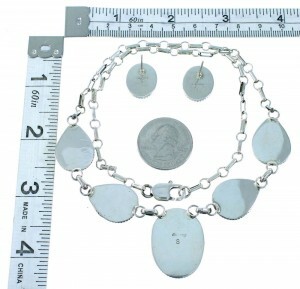 Necklace measures approximately 20-1/2" inside circumference, allowing the side links to measure approximately 1-1/8" long and 7/8" at widest point, and the center link measures approximately 1-1/2" long and 1-1/4" at widest point. Post earrings measure approximately 5/8" long and 1/2" at widest point. 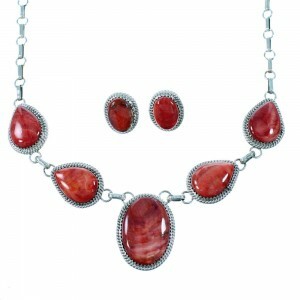 This is a very exquisite necklace set that must not be overlooked! 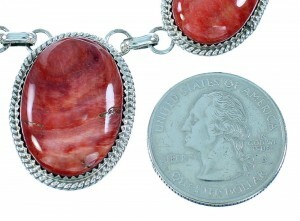 This piece of Native American jewelry is Navajo hand crafted, out of genuine sterling silver and real Oyster Shells. The necklace has a total of FIVE stones; each link has ONE stone that is delicately set in a silver bezel setting while twisted silver can be seen accenting the necklace for a fabulous finish. 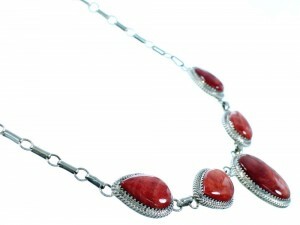 The necklace is stamped sterling and hallmarked. 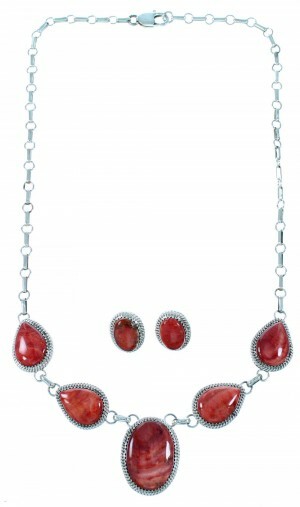 The earrings perfectly match the necklace and have a total of TWO stones (ONE in each earring). The earrings are stamped sterling and hallmarked. The set has a total of SEVEN stones.